Worried by the increasing unemployment of teeming youths in Kwara State, the State House of Assembly has enjoined the state government to resuscitate its breach employment scheme and other youth employment drives to check trend. This was the resolution of the House, following a Matter of General Public Importance raised by member representing Essa/Shawo/Igboidun Constituency, Hon Hassan Oyeleke, on the need for the state government to embark on proactive steps in addressing the problem. The Deputy Speaker, Hon Matthew Okedare, while reading the resolution of the legislature said the need for the state government to take urgent steps towards addressing the problem became expedient to check the trend. The House also enjoined the state government to reinvigorate the office of the Special Assistant to the Governor on Youth Employment to link youths from the state with available opportunities in the Federal Civil Service and in the private sector. Hon Oyeleke had while raising the matter emphasised the need for the state government to be actively involved in the employment drive for the teeming unemployed youths in the state. Other members who spoke on the Matter disclosed that the state had the highest number of unemployed youth in the north central geopolitical zone of the country and enjoined the State Government to demonstrate greater political will in proffering enduring solution to the problem. 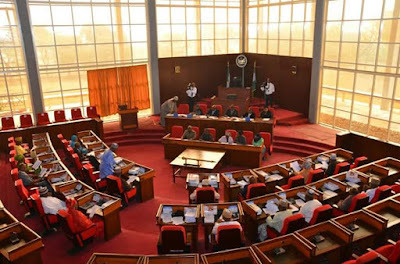 The House equally after its Thursday's sitting, received the management of Adesoye College Offa who were on a thank you visit to the House over the leadership of the State Assembly's role during the demise and burial of the Proprietor of the College and Asiwaju of Offa Chief Emmanuel Adesoye.